Departement of Vaucluse - Pop. 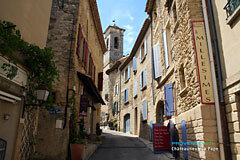 : 2,200 h.
18 km North of Avignon on the N7 to Sorgues and the the D17. 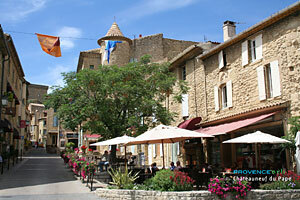 Located between Avignon and Orange, Chateauneuf-du-Pape spreads out at the foot of the remains of it's fortress castle.. 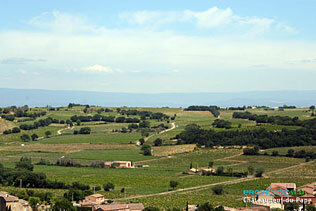 The village looks over the plain of Comtat and the 3 000 hectares of vine fields. The village is almost completely dedicated to its world famous wine "Chateauneuf du Pape" which is also part of the similarly famous Cotes du Rhone. In the XIVe century Pope Jean XXII, chose Chateauneuf as the location for their summer residences, and then decided to plant vines on the stony land which surrounded their landholdings. For a long time the wine production remained a secret but started to become well known in the XVIIIe century but it was in 1929, that it was officially recognized and bestowed with it's own appellation Châteauneuf-du-Pape. This appellation means that the wine production in Chateauneuf du Pape is subject to strict controls to ensure that the 55 vineyards produce an extremely fine wine. When you visit the village stop at the "place de la Fontaine". 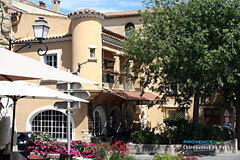 In the center of the village you will find a number of wine tasting cellars from the different domaines. If you don't know exactly what you are looking for the choice will be very difficult and wine tasting can quickly make you dizzy... The cellar facades are all different from each other. Some seem luxurious even pretentious, others are extremely simple. Some are on the ground floor of a village house, others you need to go through a small doorway or down a narrow passageway. Whatever, here all the roads lead to the altar of good fine wine. Continue your village visit down the twisting narrow streets with their numerous beautiful fountains including the XIV° century Souspiron fountain, you'll see the ancient bread oven and olive press and you can walk as far as the Papal castle built by his holiness Pope Jean XXII between 1316 and 1333. Wide stone staircases take you up to the fortress where the Popes lived until 1377, and their return to Rome. 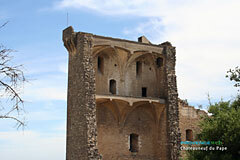 The fortress was badly destroyed by fire during the religious wars and then further damaged in 1944. Little remains apart from a short stretch of wall, one of the high towers and a lower room. 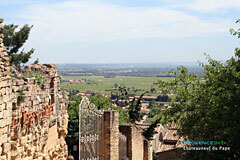 However from the ruins there is a 360 ° panoramic view over the Rhône valley , the Luberon, Avignon and the papal Palace which can be seen in the background. At the exit to the village there is an interesting little museum of wine making equipment at the Anselme vineyard. The Museum displays a large collection of wine making tools and machinery some of which date back to the XVI° century. These include a wine press, barrels and numerous cork screws. 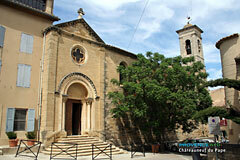 Further on you can find the Romanesque Saint Théodoric 's chapel which holds art exhibitions during the summer months. The remains of the papal castle (XIV°). The Hers Tower (XII°). Shrines. Chapel St Pierre du Luxembourg (XVIII°). 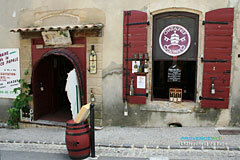 The Wine cellars, the Wine makers museum. Walking, Mountain Biking, Swimming pool, Tennis. Fishing. Summer events, Arts and Crafts. Wines of Provence : the Cotes du Rhone. Caderousse (10km), Courthézon (6km), Bedarrides (7,5km), Orange (10km).